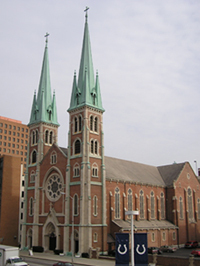 St. John's was the first Catholic parish in Indianapolis and played an important role in the growth and development of Catholicism in the city. The present St. John the Evangelist Catholic Church is a brick and stone Gothic Revival design, an important example of the work of prominent architect D. A. Bohlen. The church remains intact from its completion in the 1860s. Originally, the city’s first Catholics chose a site at West and Washington Streets. In 1846, the parish bought the current site and built a second church. This proved too small by the 1860s, and the parish hired Dietrich Bohlen to serve as architect for a new sanctuary in 1867. The grandeur of St. John’s stems from the idea that this newer church would soon become the Cathedral of Indianapolis, a plan that never materialized. Instead, the city’s many Catholic nationalities decided to build their own houses of worship – Irish, near Fountain Square; Germans, at St. Mary’s near Lockerbie Square; Italians, just north of Fountain Square. St. John’s nonetheless continued to serve many Catholic families. It had a private school at this site early on. The red brick, two story rectory dating from 1863-1867 was also planned by Dietrich Bohlen. St. John’s is among the earliest churches left in the city and one of the best examples of Gothic Revival architecture. Unlike English-inspired Gothic Revival, Bohlen’s Germanic design is highly symmetrical. The use of soft red brick with contrasting limestone underscores the balanced composition. The rose window is composed of plate tracery in limestone pierced by Gothic lobed openings, instead of Late Gothic style lacey work. Lofty plaster simulated quadripartite vaulting encloses the beautifully maintained interior. Rich Victorian colors highlight the sanctuary. Though the church was largely complete by the 1870s, the spires were designed by Oscar Bohlen of D. A. Bohlen & Son and added in 1893. St. John the Evangelist Catholic Church is located downtown at 121 South Capitol Ave. The sanctuary is often open daytime hours for contemplation and for Saturday and Sunday mass. Combine a visit to the church with a tour of the Indianapolis Union Station—Wholesale Historic District.